Tom Saintfiet has been appointed national coach of Zimbabwe, despite being halfway through a four-year deal with the Namibia national team. 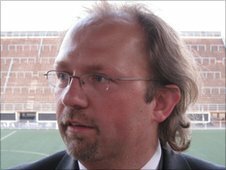 The Belgian spent four days in Zimbabwe before being given the position, despite divisions within the Zimbabwe Football Association (Zifa). The media and vast majority of fans wanted acting coach Norman Mapeza to be given the post on a permanent basis. A Zifa technical committee recommended Saintfiet despite his Namibia links. He had stated categorically that Zimbabwe would not replace former Warriors captain Mapeza with the Belgian coach. Although the technical committee had not included Mapeza in their proposed Warriors set-up, he has been made assistant coach to Saintfiet, along with another former Zimbabwe international, Madinda Ndlovu. Saintfiet's arrival re-ignited the argument over the merits of a foreign coach, especially as Zimbabwe's two appearances at the Nations Cup finals have come under the guidance of local coaches.